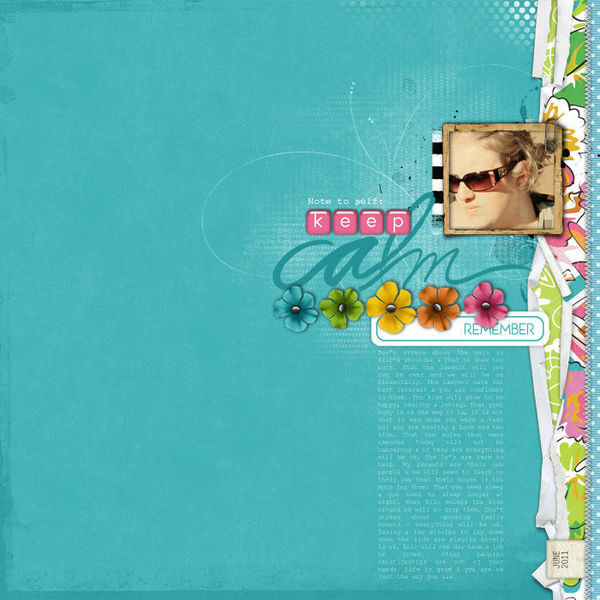 Your title can not only contrast with the other elements on the scrapbook page — it can also have contrast between the parts that make it up. You can add contrasts in color, typeface, size, dimension, styling and more. Take a look at five pages with high contrast titles. The message of Kayleigh Wiles‘ page “Keep Calm” is exactly what the title says, and her titlework choices draw the eye and convey this message. There’s contrast in dimension, texture, size and tone between the thick and glossy epoxies and the flat font rendered in a shade of blue that’s just a bit darker blue than the canvas upon which it sits. “Two serif fonts can lack interest but two script fonts can overwhelm the eye. Combining one with the other often creates the perfect balance. I also like to mix fonts and sizes within a single word to create a focal point. The wordart is completed by selecting colors from my layout using the color picker. On this layout I also used Photoshop Transform tools (Perspective and Warp) to manipulate the word “memories” to make it look as though it were printed on the envelope in the underlying image.